The Arvada Chamber of Commerce is pleased to launch a new workforce initiative, Arvada Works, geared toward engaging employers, educators and partners across Arvada in developing a new demand-driven approach to close the skills gap. 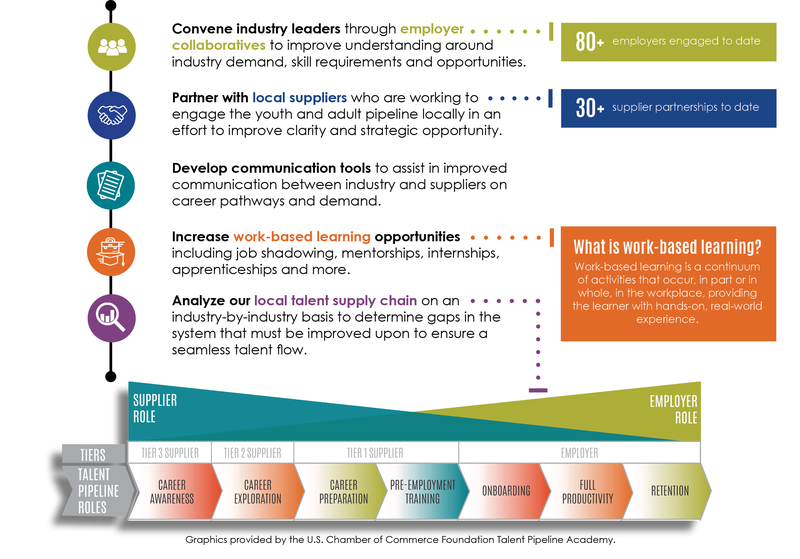 Through extending lessons learned from innovations in supply chain management, this is a call for employers to play an expanded leadership role as “end-customers” of education and workforce partnerships. The Arvada Works talent pipeline program is modeled off a national program from the U.S. Chamber of Commerce Foundation that has successfully launched in over 50 communities across the country and the Arvada Chamber of Commerce is lucky enough to be one of the selected sites to continue this incredible demand driven work. The #1 issue identified by small and large employers in Arvada is the lack of a qualified workforce. This skills and people gap means that employees are not prepared to meet the needs and grow the economic base of Arvada and Jefferson County. This will have major implications on our local economy long-term. The Arvada Chamber of Commerce will serve as a convener for local industry to connect with education and community partners who are preparing our future workforce. By bringing stakeholders together, the Chamber will champion improved communication, breakdown of negative stigmas and, ultimately, necessary system changes. More training partnerships coming soon! April 22-28 – New in 2019! The Arvada Chamber will work with education and community partners to raise awareness around the Career First concept by giving the youth and adult workforce pipelines an opportunity to experience careers across Arvada. Learn more here! Hiring for success – Job postings, interviews, onboarding | Details coming soon! Our Changing Education System – A School Level View | Details coming soon! Retention Woes – Tips To Keeping Employees | Details coming soon!